Searching for a home within the Columbia Elementary School Zone? Then you are in the right place! 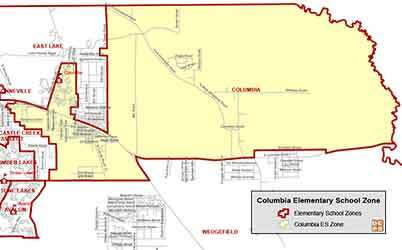 Students of Columbia Elementary reside within the 32820, 32833 and 32709 zip codes. In February 1969 the new school site was called “J”. The school was named Columbia after Apollo 11 Neil Armstrong’s Command Module that sent the lunar module “Eagle” to the moon on July 20 1969. School started the day after Labor Day on September 3, 1969 for Grades 1 – 6 in portables off Story Partin Road with 14 classroom teachers; 6 new teachers and 5 men (12 classroom teachers, 1 reading, teacher, one aid, a speech therapist, two janitors, a secretary and 430 children), The new two-story building was occupied September 8, 1970. Due to all the acreage surrounding the school campus, OCPS determined that it would be a good site for a relief High School (East River). So in 2007, after 38 years, Columbia Elementary moved to a new location two miles North of the original school location. Columbia Elementary is located in a new state of the art facility within the Cypress Lakes subdivision in East Orange County. It is located twenty miles east of Orlando, Florida. Columbia's geographic service area extends twenty miles east to Brevard County, eight miles south to Osceola County and four miles north to Seminole County. The total service area exceeds 240 square miles.